I always get strange looks when I try to avoid cokes, kool-aid, and other sugary drinks for my kids. But with diabetes lurking on both sides of our families, I feel obligated to try to help my kids make healthier choices and have better habits than we do. 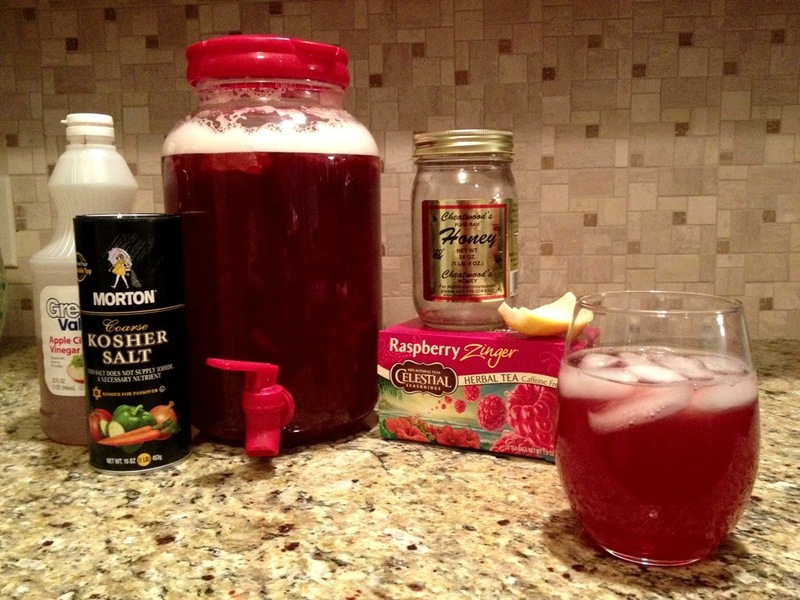 So I was intrigued when I found a recipe for a Kool-Aid alternative. Upon looking at the recipe, though, I knew it wouldn’t work for us… because it called for stevia (which tastes gross to me) or other non-calorie sweetener (which I am unwilling to do.) Still, the idea got me thinking… what other healthy things could I sneak into my kids’ drinks? Herbal Tea. Herbal tea has a variety of health benefits, such as providing antioxidants, stress relief, promoting healthy sleep habits, and many other benefits. Local Honey. Local honey is believed to help with seasonal allergies. Apple Cider Vinegar. Supposedly, apple cider vinegar is practically magical and helps with energy, weight management, pH balance, cleansing of the lymph nodes, and a ridiculous list of other things. Lemon and Salt. These items are used purely for electrolyte purposes. During summer, it’s very important to keep your body hydrated. This recipe can also be used in place of Pedialyte when a child is sick. I steeped the tea bags in two different sets–5 bags for each set. You can boil the water and then allow the bags to steep in the water for a while… I cheated and used my Keurig to make the water. Anyway. Let that steep for 15 minutes or so. Then, I added the honey. Don’t skimp on the honey. Add the other ingredients. Be careful not to overdo on the salt. Combine all of that in a two gallon container and fill the remainder of the container with water. Mix. Hi, I`m excited to try this recipe out this summer! Question though…how many cups of water did you steep the tea in? Thanks!